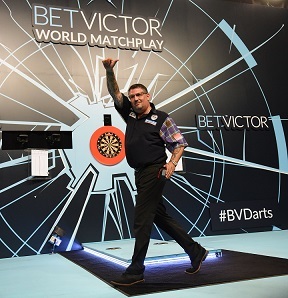 GARY ANDERSON and Mensur Suljovic will contest the BetVictor World Matchplay final after ending the hopes of Jeffrey de Zwaan and Peter Wright at Blackpool's Winter Gardens on Saturday. Scottish star Anderson's bid to add to the UK Open and US Darts Masters titles he has already claimed so far in 2018 continued as he brought an end to De Zwaan's brilliant World Matchplay debut. The young Dutchman had knocked out Michael van Gerwen, Adrian Lewis and Dave Chisnall to reach his first TV semi-final, and took out three ton-plus finishes and a pair of 11-darters as he traded legs with Anderson. 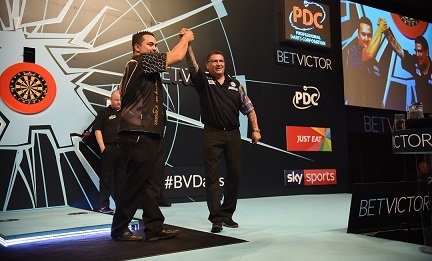 However, the two-time World Champion showed his class with a heavy-scoring display to back up the nine-darter he landed in the quarter-finals as Anderson won through to his first Blackpool final with a 17-12 success. De Zwaan remained in touch at 11-9 despite 11 maximums from Anderson, but four missed doubles crucially allowed the Scot a let-off as he opened up a three-leg cushion. After the pair traded 180s in leg 23, Anderson powered in a 152 checkout as he moved 14-9 up and also added finishes of 112 and 100 to finally see off the Dutchman's challenge by a five-leg margin. "It was good performance and it had to be to beat Jeffrey - he has a great attitude and he is a very good dart player," said Anderson, who hit 16 maximums and averaged 106.06. "We kept following each other's 180s, I knew it was going to be a hard game and I started to get a bit nervous at the end. "I'm happy with he way I played. The 180s were good but my finishing was a bit iffy at times. It's going well with my new darts and I love them." "I love Mensur to bits and he's a gentleman, but I hate playing him!" admitted Anderson. "Jeffrey's style suits me but I've been fighting hard in the last few weeks and I feel I can win whether I play fast or slow. "I'm just going to get on with it. I think we will see a different Mensur tomorrow - I've got a different head on than when I used to play him so we'll see what happens." Suljovic booked his spot in the final with a 17-13 defeat of 2017 finalist Wright to continue his bid to win The Phil Taylor Trophy and the 115,000 pound top prize. Wright had been in sensational form during Friday's quarter-final victory against Simon Whitlock, but was unable to repeat the performance - particularly on his doubles after missing 22 shots during the tie. A see-saw opening saw Wright lead 3-1 before Suljovic took out 87 - for an 11-darter - and 70 to move himself ahead. A 136 checkout from Wright levelled, and after Suljovic secured an 8-5 cushion the Scot pulled back to level after 20 legs. Suljovic, though, broke on double 12 and then powered in a 151 checkout as he pulled clear with four successive legs before maintaining the advantage, despite a 13-darter from Wright, to book his spot in the final. "I am so happy to win this match," said Suljovic, the reigning Champions League of Darts and German Darts Masters winner. "I didn't think I would win - I was very nervous but I didn't tell anyone. I have already reached my goal, anything else is a bonus but I will give it 100%. "Thank you to the fans, the crowd was brilliant saying 'come on Mensur' - they helped me win this game."